One you have identified the street populated by madams using the city directory (see Part 1), you can find them on the Sanborn fire insurance maps. Sanborn fire insurance map books are located in universities, local libraries, and historical societies around the country. They are also scanned and can be accessed electronically at an institution with a subscription. Many universities subscribe to the Sanborn map collection for the city of the school. Georgia’s Sanborn maps to 1922 are available through the Digital Library of Georgia at http://dlg.galileo.usg.edu/sanborn/. 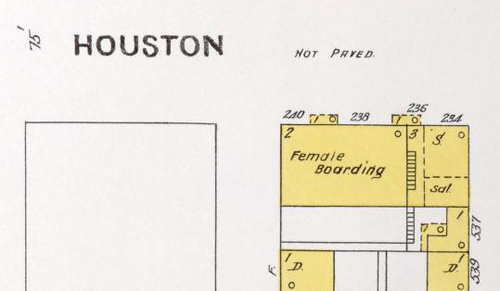 Sanborn fire insurance maps identify brothels by the term “Female Boarding,” or “F.B.” abbreviated. They also provide information about the physical structures, including outlines of the buildings, number of stories, and building materials (red for brick, yellow for wood, blue for stone). 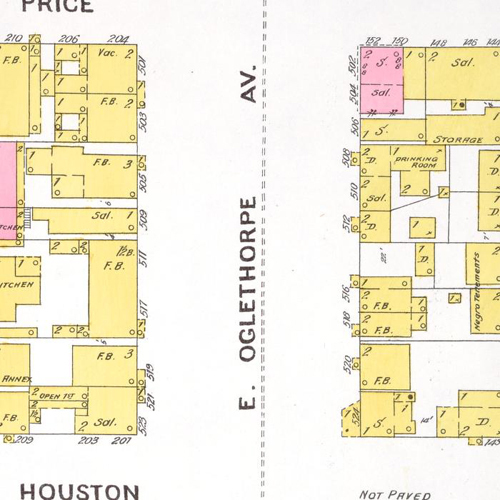 Looking at East Oglethorpe Avenue in Savannah (1898), we find numerous houses with the label “F.B.”, with addresses matching those from the city directory. The houses range in height from one to three stories. A Saloon and Drinking Room are located at numbers 510 and 508. This large house on Houston Street is identified without abbrevation. It was occupied by Lizzie Ryan and Bessie Stafford and joined a saloon. Now that we know the names of the madams and where they lived, it is time to learn a little more about their personal background. How old are they? Where did they come from? Do they own or rent the house? To answer these questions, we turn to the U.S. census and Part 3 of this series.